Philip Weeks is a leading expert on natural medicine and nutrition and is a master herbalist and acupuncturist. He is an engaging, informative presenter and is renowned for his deep understanding and knowledge of ancient medicine. He is well versed in Ayurvedic, Arabic, Chinese and Greek medicine and utilises these systems by making them relevant to today. Philip is frequently requested to write in magazines. He has written for ‘Get Fresh’, ‘Kindred Spirit’ and ‘Natural Health’. He is on the expert panel of ‘Cook Vegetarian’. His work has been featured in the Daily Express, Mail on Sunday, Metro and magazines such as 'Reveal'. He is asked to regularly teach in London on many aspects of holistic health care, organised by ‘All about Natural Medicine’. 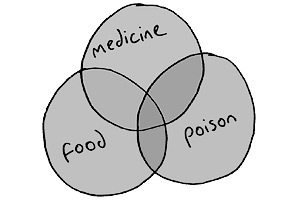 Philip has featured on the radio presenting a series called, ‘Medicines in your kitchen’. His first book “Make Yourself Better” will be released in January 2012. Philip sees patients in Hereford and in Harley Street from all around the world. He has conducted some 10,000 consultations since starting his practice 12 years ago. Philip established his clinic after qualifying as a master herbalist in 1999. Whilst seeing patients in his hometown, Hereford, he also trained at the college of Integrated Chinese medicine in Reading and obtained his licentiate in acupuncture in 2005. He also trained with Dr Tan in treating pain with acupuncture. He also integrates Master Tong's approach which provides a very effective blend of techniques to optimise the effectiveness of his acupuncture treatments. He has travelled from Europe to India in search of holistic medical techniques. He has sources from around the globe where he collects unique medicinal ingredients. Philip has recently had his first child. His interest in health for children has since grown as he's seen first hand how natural approaches to pregnancy and birth have aided his partner throughout the experience. He has a particular interest in Parkinson's Disease and has trained with Lucille Leader in supporting these patients with a nutritional approach.